The Port of Blyth has announced that a major new development opportunity has arisen for operators in the dry bulks sector wishing to move goods in and out of the UK by sea. 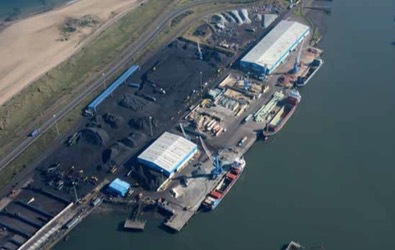 Due to a streamlining of services at the leading North East of England port and continued investment at the rail-linked Battleship Wharf terminal, the port is now able offer potential partners a range of cost effective solutions including the rapid turnaround of vessels, the use of purpose built dry bulk warehousing and open storage options as well as excellent road and rail links including access on to the east coast mainline. An important gateway for the movement of dry bulk cargo in and out of the UK, with easy access to markets in Scotland and northern England as well as strong transport links to southern England and Wales, the port offers high quality solutions delivered by a dedicated and highly trained workforce. Strategically positioned on the east coast of the UK, the Port of Blyth is perfectly positioned to service clients importing or exporting to and from mainland Europe or further afield. Located in a sheltered bay, Port of Blyth is an all-weather port offering near 365 day-a-year access into deep water berths. Known for fostering long-term partnerships with clients, the Port of Blyth’s consistently high service levels make it the ‘go-to’ northern UK port of choice for many dry bulk customers. Handling vessels up to 35,000dwt, the port has developed a strong reputation for the quick turnaround of cargoes at 15,000 tonnes per day, with a particular expertise in coal, aggregates, agribulks, biomass and chemicals. Mobile 100-tonne cranes with 20m3 grabs provide versatility and flexibility. Vessel and terminal handling is also backed up with a modern dry bulk rail loading facility capable of moving 1,500 tonnes per day and an extensive array of handling equipment including bulk tippers, load shovels, dozers and bobcats. For weather- sensitive cargoes, a complex of ten modern dry bulk warehouses are located immediately adjacent to the working quays with integrated bulk walling. Large secure areas of purpose built open storage are also available with water spray dust suppression systems, concrete pads and bulk walling as appropriate. In addition to the standard services provided by the Port of Blyth, it also delivers a number of key value-added services in line with clients’ specific needs. Port of Blyth offers additional services such as blending, bagging and screening, as well as a full temperature monitoring provision and under floor aeration facilities. With staff trained exclusively by the port’s award-winning training subsidiary Port Training Services, the continued development of the skillset of every member of staff ensures a standardized level of high quality service across the port. For those customers with specific requirements relating to finer dry bulks, the port operates a specialist standalone terminal for bulks suitable for pneumatic discharge to silo and then onto rail or road. The port’s ship handling operations are supported by extensive open and covered storage facilities providing an essential buffer for the efficient and cost effective movement of all cargoes. More than 10,000m2 of high-quality covered bulk warehousing is provided at Battleship Wharf alone, alongside large areas of open storage close to working quays and all within a fully secure port terminal environment. Together with extensive CCTV coverage, this ensures all goods remain safe and secure. The Port of Blyth is the port operating division of Blyth Harbour Commission, an independent statutory trust established in 1882 and operated for the benefit of stakeholders including customers, staff, the local community and the wider regional economy. This unique model of ownership and management ensures that all surpluses are able to be re-invested into improving the facilities and services offered by the port, with such regular investment benefiting clients and enabling them to prosper.